Be still, my heart. What a wonderful way to start the week. My tail twitches in greeting as a new lovely kitty arrives for an interview on my blog this Monday morning. May I ask your name, and please also tell me about your author? Hi, Sneaky. My name is Tinkerbelle and my author’s name is Mollie Hunt. Mom’s name is Lynley Cannon and people call her the Crazy Cat Lady, but she’s not quite crazy yet. My loveliness is featured in 2 of the 3 Crazy Cat Lady cozy mysteries, Copy Cats and Cat’s Paw. I plan to be in many more. Those book titles are pawsome. Tell me more about your series, Miss Tinkerbelle. I am intrigued and, I must admit, a bit smitten with you. Wow, Meow. That sounded quite poetic. The Crazy Cat Lady cozy mystery series follows the adventures of cat shelter volunteer Lynley Cannon and her ever-growing clowder of cats. Lynley’s retired from her day job, so you’d think she would stay home with us, but not our Lynley. She finds more trouble than a cat in a catnip patch. You are funny as well as beautiful. Are you based on a real cat such as your author’s? If so, please give further details. I am certainly a real cat and I live with my author, Mollie, who adopted me when I was lost and stray. She and I studied to be Pet Partners, and for 4 years, I was a registered Pet Partners therapy cat. I retired this year at the age of 15 to hang in and write posts on my Facebook page. You look much younger than years, but I do enjoy the company of older women. In my Cobble Cove series, I am only 3 or 4, but the cat on whom I am based is my author’s 16 year-old Siamese, Oliver. He is quite spry for his age, too, and even interviewed me on this blog once. ‘Tinkerbelle was a round, fluffy pixie of a cat. She only weighed eight pounds, but added to the bulk of the carrier, it was a good, shoulder-wrenching load. Thankful she wasn’t Big Red at seventeen pounds, or worse, Violet, at twenty two, I went into the building and down the brightly lit hallway to Lenore’s room. Her door was ajar so after a token knock, I let myself in, closing it softly behind me. Lenore was sitting up in her hospital bed reading. Per protocol, I gave her a once-over to see how she was doing. With a sigh of relief, I noted she seemed no worse than the last time I was there. The eighty-seven-year-old was rail-thin with the yellowish complexion that accompanies liver difficulties, but her brown eyes sparkled every time she saw me. She always wore a colorful silk turban—I didn’t know whether she was bald underneath or if it was a fashion statement. She had the largest collection of silk bed jackets and robes of anyone I’d ever known, and since I had run with an antiques crowd in my younger day, that was saying a lot. Today she sported a voluminous paisley print in rust and mocha that complimented her eyes. She looked a little like a butterfly—tiny body and huge, beautiful, showy wings. “Good morning, Lenore,” I said, putting Tinkerbelle’s carrier on the floor. I try not to ask the banal, How are you, of hospice patients; as long as they were alive, that was all that mattered. “She’s good.” I opened the carrier to let Tinkerbelle out. First a cautious black nose, then a paw appeared. She stood poised for a moment, then deciding she was in friendly climes, strode from the box like the queen of all she surveyed. I clipped the leash onto her harness, scooped her up, and placed her on the bed beside Lenore. She sniffed the old woman’s proffered hand then smoothed her sideburn against it, claiming it for her own. Tinkerbelle circled and found just the right spot to lie down. I had learned long ago that when it came to pet visits, I was merely the chauffeur, so I sat by the bed and let Tink do her thing. “My nephew has bought another cat,” she said with obvious satisfaction. “Well, congratulations.” I smiled, trying not to let my preference for shelter animals over the purchased kind affect my reaction. “People don’t realize how many purebred cats end up in shelters,” I agreed. “I’m sure he will.” She stroked Tinkerbelle’s silken fur and gazed out the window. I knew she was wondering if she would still be around by then. I rose and crossed to the antique waterfall dresser, keeping hold of Tinkerbelle’s leash per Pet Partners protocol, though by the looks of her, all curled up in the crook of Lenore’s arm, she wasn’t going anywhere. Spread out on a Battenburg lace runner was a handful of color glossies. Smiling, I gazed at professional quality pictures. My smile faded. With a prickle of alarm, I stared at them dumbly. Robotically I did as I was told. My hand trembled as I handed them to Lenore. “Meow?” I finished for her. I took back one of the pictures and held it up close. I studied every satin hair, every sable whisker, the familiar blue-on-blue eyes gazing at me through the celluloid. I paid special attention to what I could see of his ears and tail; they were fully furred and perfectly tinted as a seal point Siamese should be. The last time I’d seen Meow, those parts had been shaved, the noxious colorant removed and cleansed by the FOF doctors, but that was two months previous and the fur would have grown back by now. The crooks could easily have re-applied the dye. I looked again. Yes, if the smiling Siamese wasn’t Meow, it could have been his twin brother. “Where did your nephew get this cat?” I asked a little too abruptly. “Do you think Tinkerbelle would appreciate that? Does she like other kitties?” Lenore petted the wide black back, and Tink purred in ecstasy. I stuffed the photo in my bag, took a deep breath, and turned back to Lenore. I’m clapping my paws. Very well written and acted, I must say. I especially liked that it included a Siamese. What do you like most about your role in your authors’ books? I like that I’m never required to work too hard. Most of the time I spend napping, then at the purrfect moment, I jump in to save the day. Same with me. I am usually in the cat room off the staff lounge upstairs in the library where the kind staff has made me my own “digs” excuse the pun, in our second book. Well, Sneaky, as with all cats, I can communicate telepathically with humans if I want to. It’s how we manipulate – uh, guide – them, right? But, no, I don’t speak words out loud or anything like that. Me, too. What advice would you give other cat characters? Make sure to get into as many scenes as possible. Keep reminding your author that, in a cat mystery, it’s all about you. Unfortunately, although I’ve played some interesting roles that have led some of my human co-characters to discover some things such as a clue in our first mystery, I have not felt that I have been the center of attraction in either of my two books having had to share the limelight with a dog co-star. However, I’ve asked Debbie to spice up my scenes in the third book she is writing. Mollie is working hard on books 4 (Cat Call) and 5 (Cat Café) now – I’m helping. Rats! You two seem so busy, I’m sure you wouldn’t have any time to spend with me-ow truly, but I would love to stay in touch with you. Are you and/or your author on social media? If so, please list your links. We would love it if you came over to check out all the fun things going on. Wild dogs couldn’t keep me away, Tink. Thanks again, Sneaky, for the interview. Here’s a photo of the 4 of us: (From left to right) Me, Dirty Harry, Little, and Big Red, all featured in Mollie’s books. Oh, yeah, she’s the big one at the back. My pleasure, Miss Tinkerbell. My best whiskers to you and Mollie on your upcoming books. And, don’t forget, if you ever have any spare time, I’d love a moonlit stroll with you. Maybe we could hang out at a bookstore or I could show you around the Cobble Cove library. That sounds, Pawsome, Sneaky. I will keep that in mind. Oh, my Whiskers! I am pawstruck. A lovely lady is here today for an interview. May I ask your name and who has created such a beautiful creature? My name is Belladonna and my author is Leighann Dobbs. A pleasure to meet you, my dear. Would you mind if I call you Bella? Thank you, Bella. What book(s) have you appeared in? Please list them and their genre. I slink and sleuth my way through the following Cozy Mysteries: Dead Wrong, Dead & Buried, Dead Tide, Buried Secrets, Deadly Intentions, A Grave Mistake and Spell Found. How pawsome. I have only appeared in two books so far, but my author has already started on a third in which I will play a larger role, or so she promises. I appear in the Blackmoore Sisters Cozy Mystery series. Even though the sisters think they are the main characters, I must say that I do believe most readers like me the best. Especially since my superior feline skills are often necessary to help solve the case. I am sure they are. I have not done much sleuthing so far in the Cobble Cove mysteries. However, I did lead Alicia to one of the clues in the first book. I’m going to purrfect my detecting skills in number 3, at least I hope so, but I know what you mean about the human characters trying to steal the spotlight. I also have to compete with a dog co-star. It can be quite fur-strating at times. I’m based on my author’s current cat whose real-life name is Kitty. Yes, I’m embarrassed to admit that my author didn’t have much imagination in the naming department with her. Though there is a slight variation in our color (I’m pure white and Kitty has mocha-gray markings on white) we do share the same striking ice-blue eyes which is also a trait the Blackmoore sisters (my humans in the book series) also possess. Yes, I noticed them as soon as you glanced my way, Bella. They are quite attractive, as are you. As a siamese based on my author’s cat, Oliver, I also have blue eyes. We would make a handsome pair if you are free after this interview. Please, Sneaky, you are making me blush. Sorry. Let’s get back to the interview. Can you share an excerpt from one of your books that features you in an important scene? If so, please include it. Belladonna flicked her tail against the coffee table trying to draw attention to the two maps that lay spread on the surface but the sisters paid no attention to her, preferring to oooh and aaah at the sappy love poems in the old poetry book. She sighed in exasperation, flopped down on her belly and licked the inside of her paw. Sometimes it was so hard to get through to the humans. She wondered why she even bothered. She’d spent most of the day trying to point out the very page in the journal they should look at. But they’d paid no attention, even going so far as to shoo her away! She felt the hairs on her back prickle and sat upright, becoming alert to the energy in the house. Something was happening below … something that needed her attention. She slipped out of the living room and into the kitchen, pausing at the rope covered scratching post her humans had conveniently installed in the pantry, and took a few seconds to hone her claws to needle like points. She would need them to be as sharp and deadly as possible. Wow, Meow! That is some fur-raising scene. Though often I am relegated to the background, my assistance is always necessary for the Blackmoore Sisters to succeed. They are very lucky to have you. Aside from one chapter in the book Dead Tide (the excerpt above is from that chapter), readers don’t get to know what I am thinking. I do meow a lot though. I’m a great meower myself, although right now I am purring in your presence. Be patient with the humans, they don’t have our superior intelligence. It’s best to push them toward the clues but make them think they found them on their own. If all else fails, a strategically placed hairball or mouse head will always get their attention. MOL (Meow Our Loud). You are funny as well as pretty. I love a gal with a sense of humor. A new book in my series will be out in March. It is called “Fatal Fortune” and in the book we visit an island that is the fictional version of Oak Island in Nova Scotia to retrieve an old relic that was buried there by pirates. The idea for the island came from one of our readers, so it was really fun for Leighann to research and write about this interesting place. Readers can make great suggestions. A few of Debbie’s readers have sent in purrfect ideas for names in her character contest. Connect with Leighann on Facebook and don’t forget to tell her I sent you! I won’t, Bella. I hope you don’t think I’ve been too frisky during our interview. No, Sneaky. You’ve been a purr-fect, gentlemen, and I had a great time chattering with you. Likewise. I really enjoyed our talk. Best whiskers to you and your author on your upcoming release and future books. Happy Thanksgiving, Kitties. Instead of a Feature Friday Film, I thought you might enjoy viewing this holiday video while you chow down on your turkey. Meow, there, my dear readers. 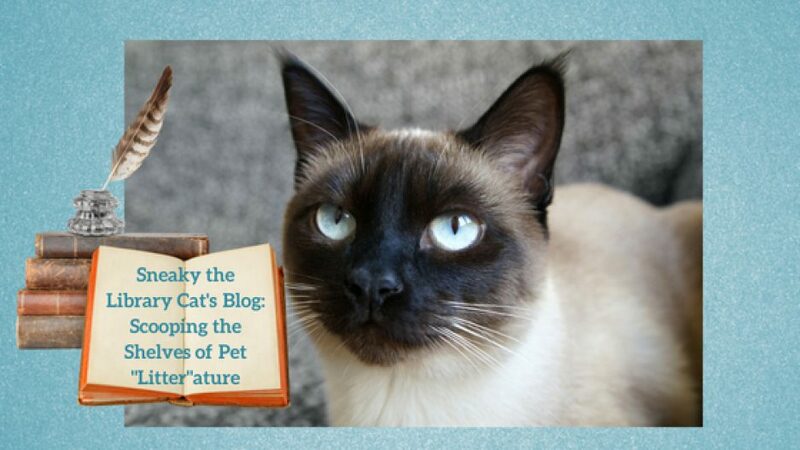 It’s my pleasure to present Alex the Cat who will talk about his books and his author, Dina Porell. Hey, Alex. What book(s) have you appeared in? Mice. My author’s daughter is 12 and might enjoy your books. Yes, I was based on a real life stray cat in South Korean streets and my author rescued me. Wow! That must’ve been very exciting. I have never been to South Korea. My books take place mostly in New York State. Raising awareness of stray cats and the problems they face in everyday. My author dreams of a day where all of the kittens have a warm home! That would be wonderful indeed. Even though I’m not a real cat and only live in the pages of a book, I sympathize with poor, homeless kitties. In fact, my character, Sneaky, was a stray cat who was luckily taken in by the kind people at the Cobble Cove Library. I talk to other cats and meow to humans. Be your charming meowing self! And stay out of trouble. No, but my author just finished a short story about cat twin. Maya and The Mystery of The Cat Burglars made the long-list of The Golden Baobab prize for the early chapter book category. My author’s on twitter at @DinaPorell. Thanks so much for dropping by, Alex, and best whiskers to you and your author on her books. Meow, there. It’s Sneaky. I am so excited to share a great video with you today and some pawsome information about a new, monthly event for my author’s readers. First, I want to thank all those great authors who helped me, Debbie, Alicia, John, and Fido host our Cobble Cove mysteries birthday party on Facebook this week. I can’t help purring when I recall all those cats who attended as well as the human reader guests, of claws. It was one fun paw-ty. Now for the great news. Debbie’s brilliant 7th-grade daughter came up with a purr-fect idea. All the characters from the Cobble Cove mysteries including me-ow’s truly, will host a monthly event called Cobble Cove Character Chat on the first Wednesday of each month. There will be a different character each month. That character will “chat” with anyone who visits the page that day. The character will post some information about themselves, maybe share an excerpt from a book in which they appear, and also offer a contest, freebie, or something else of interest to readers. Those who visit the CCCC event page may ask any question(s) they want of the character of that month. Doesn’t that sound as cool as catnip? Why not drop by and check out the first chat on Wednesday, December 7? And, now, our feature film. Created by Taylor Henderson and Sara Schoen of Stolen Glances Promotions. It is a trailer for Between a Rock and a Hard Place, the second Cobble Cove mystery that was just released. If you look really close at the opening clips, you will spot Debbie’s cat, Oliver, who looks a lot like me.